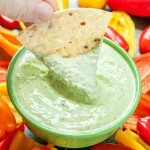 This super speedy Jalapeno Dip is sure to be a hit at your next party or potluck! Mayo-free and loaded with flavor, each bite will have you coming back for more! Recipe yields 2.5 cups of dip. Combine ingredients in your trusty food processor or blender and blend to creamy perfection! It's that easy! For a custom spice level, feel free to remove the seeds from the peppers and keep them on the side. Then simply add as many seeds back in as you'd like and blend. The more seeds you add, the spicier the dip will be! For a milder dip, feel free to remove the veins and seeds from each jalapeno, you can bend both back into the dip to adjust the heat level. There's no wrong way to make this dip! If you accidentally go too heavy on the heat, cool the dip down by adding extra yogurt or cream cheese. Easy peasy! Craving MORE spice? You're dangerous, Maverick! Feel free to add an extra jalapeño or even season the dip with red pepper flakes. I'll be there to fan your face and give you a cold glass of milk.